Over the past weekend (11 - 13 June 2011) the second annual Nelson Mandela Bay Wine Show took place at the Nelson Mandela Bay Stadium and it was a huge success with crowds through the door and cases (ok, I won't say how many cause I don't know at this stage, but it was a lot) by the load exiting back out the door with said crowds. 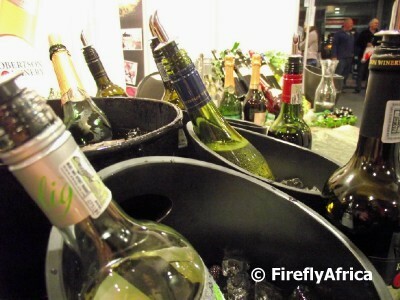 With more than 50 top wine estates represented the show had something to offer for each and every taste, even this intrepid blogger who isn't the most frequent drinker around. 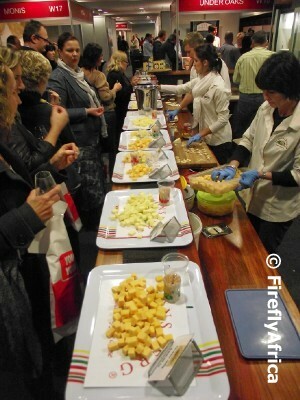 In between the wine the tasters also had the opportunity to head over to the Simonsberg Cheese stand where some of their best cheeses were on offer for both tasting and purchase. I love my cheeses and except for getting reacquainted with their Brie, which is one of my favorites, I also discovered a new friend in their matured Cheddar. The most interesting stand at the show must have been the one belonging to La Carla Catelier and the Hot Chocolate Cafe. 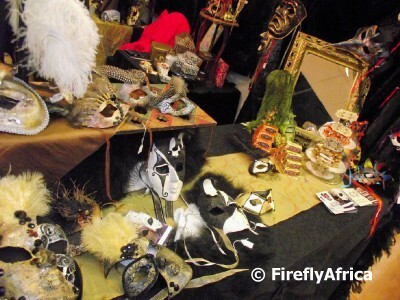 Based in Plettenberg Bay, La Carla Cartier produces unique handcrafted Venetian carnival masks while the Hot Chocolate Cafe does Belgian chocolate fudge and handcrafted chocolates. The chocolates were so popular that they had to have more delivered from Plett as they were selling out on Saturday afternoon already. 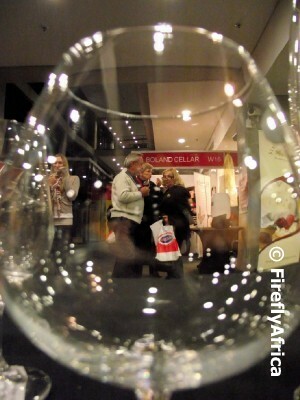 Although wine can be enjoyed on its own, it can be even more enjoyable with some good food. 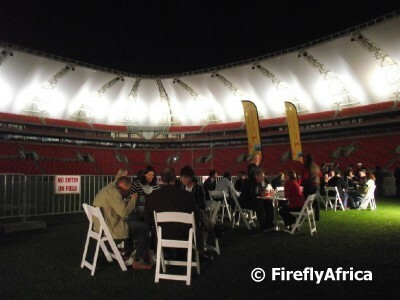 The stadium management set up a dining area outside next to the playing field in the stadium where people could enjoy their wine along with a plate of food in an unusual setting. Not being much of a wine drinker I'd be more attracted to the cheese, and especially the chocolate. The masks are also very interesting. Wonderful pictures! The sense of being there myself come right thru!